Zeer goed en snel opneembare vloeibare vorm van magnesium! Chela-Mag B6® Forte SHOT contains a highly-absorbable liquid form of magnesium in the form of amino acid chelate by Albion® in a 375 mg single-dose of pure magnesium ions enriched with vitamin B6. 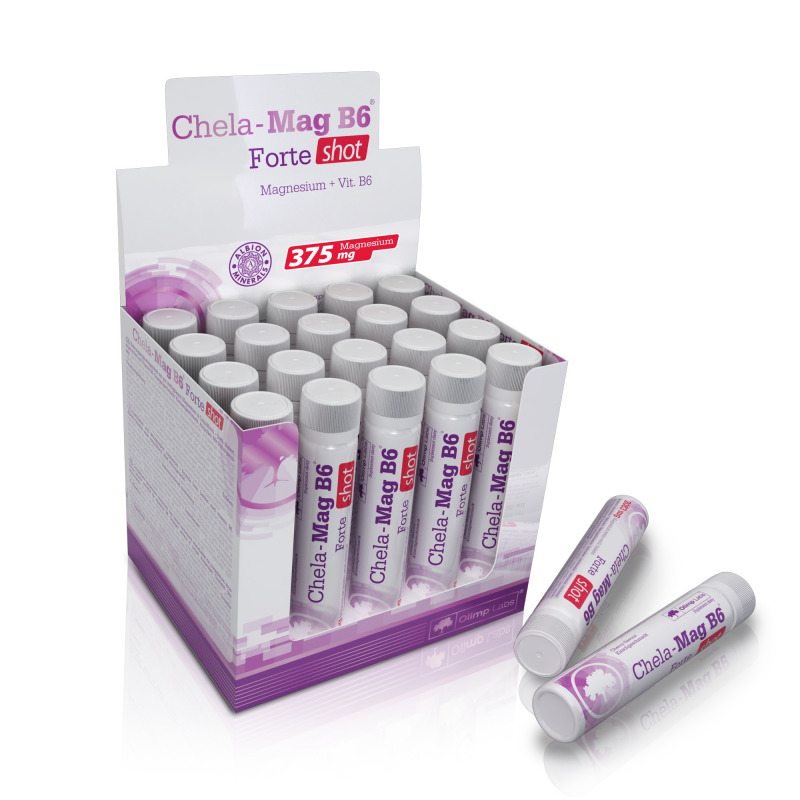 One ampoule of Chela-Mag B6® Forte SHOT covers 100% of the daily needs of the human body for magnesium. Using the innovative Liquid Technology formula enables the active components present in liquid form to be absorbed immediately, without the delay typical for tablets and capsules. All this comes in a handy 25 ml ampoule guaranteeing excellent convenience and the possibility to take it at any moment. Ingredients: Water, 8,3% magnesium bisglycinate (as magnesium amino acid chelate Albion®), acidity regulator – citric acid, aroma, sweeteners – sucralose, acesulfame K, vit. B6 (pyridoxine hydrochloride), preservative – E200, colours: beta-carotene (for orange flavour); mixed carotens, carmine (for cherry flavour). The product is designed especially for people as an aid to maintain adequate magnesium level in the body. 1 ampul na de maaltijd opdrinken (schudden voor gebruik).